This site is for those interested in the Chilton Monoplane - an aircraft designed over seventy years ago but still an outstanding example of British design expertise where once we led the world. The Chilton is truly a design classic, designed by two very bright young aeronautical engineers - Reggie Ward & Andrew Dalrymple, though no doubt their De Havilland training had a lot to do with it. 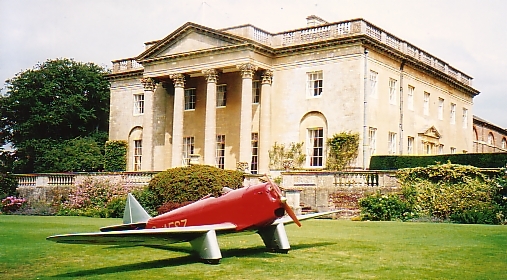 These aircraft were built in a small workshop within the grounds of Chilton Lodge, the stately home of Ward’s parents and from whence the aircraft acquired its name. See the Chilton Estate website :- The Chilton Estate website. One can only ponder at what might have developed post-war had it not been for the severing of their partnership due to the tragic death of Andrew Dalrymple in the mid-air break-up of a Fieseler Storch aircraft on Christmas Day 1945. Original aircraft - G-AESZ to G-AFSV contains a brief history on each of the four original Chilton Monoplanes. Chilton Info - Chilton history gives some detail of how the Chilton came about plus the 1938 Chilton brochure details. - Pre-war & post-war articles is a selection of articles and information on the Chilton Monoplane, further articles will be added if found, but I believe I have all significant articles that have been published. - Chilton engines gives information on the Mikron and Carden Ford engines. - New aircraft builders gives details on who's building what, where! - New Chilton information shows various details and mods - to be expanded. Gallery - Gallery contains photos of each of the four Chiltons and general related photos, new photos will be added from time to time. July '11 - See latest photos of G-AFSV. May '11 - New builder - Airy-Hugues Millet, Le Coudray, France. May '11 - New builder - Brian McDonald, Ohio, Siljan, USA. March '11 - New builder - Gunner Olsen, Siljan, Norway. March '11 - New builder - Slava Harlamor, Pleasanton, Texas, USA. Feb '11 - New builder - Martin Waghorn, Sunbury On Thames. Feb '11 - New builder - Dave Reid, Haveringland, Norfolk. Has taken over the project originally started in April '94 by Paul Humphrey, fuselage and rudder done. Feb '11 - New builder - Dennis K Williams, Polk City, Florida, USA. Jan '11 - New builder - Dr. Thomas Taylor, Berlin, Germany. The content of this website is copyright © Roy Nerou unless otherwise noted. All rights expressly reserved. The content of this website can be accessed, printed and downloaded in an unaltered form with copyright acknowledged, on a temporary basis for personal study that is not for a direct or indirect commercial use and any non-commercial use. Any content printed or downloaded may not be sold, licensed, transferred, copied or reproduced in whole or in part in any manner or in or on any media to any person without the prior written consent of the copyright holder Roy Nerou © 2001.